Cholla Prime Steakhouse showcases the finest qualities of classic steakhouse cuisine in an intimate and sophisticated setting. 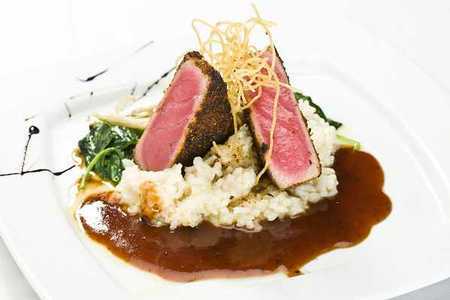 Ideally located in the Casino Arizona, Cholla offers a thoughtful and intriguing menu that boasts bold, simple flavors. The Smoked Crispy Duck is rich and satisfying, while the Red Pear Frisee Salad is a delectable palate cleanser. Cholla also presents guests with the difficult choice between entrees like the Encrusted Lamb Porterhouse, the Grilled Pacific Salmon, and the Bacon Wrapped Elk Tenderloin. All these wonderful dishes and more may be savored until midnight on the weekends, ensuring one’s evening ends on a high note. The map for this place puts it past Talking Stick / well past shea rd... Cholla is actually at Casino Arizona - McKillips and the 101. We weren't able to dine at Cholla because we couldn't find it. Ate at talking stick on the 14th floor. nice view. too expensive for the food we were served. Waite staff good..